Several incarcerated persons joined those in attendance from the community in the celebration of the Liturgy to say goodbye to their chaplain. Fr. John preached a moving sermon offering many Scriptural connections to incarceration, especially encouraging the incarcerated persons present to keep the faith through the coming time of transition. Fr. Steven thanked Fr. John, on behalf of the Orthodox Church in America, for his dedicated service as a chaplain, and led those present in singing “Many Years” to Fr. John. Fr. Thomas invited all to return to St. John the Wonderworker Church for a celebratory lunch, including ribs! As cell phones and many other items are not allowed in the facility, no photos were taken during the Divine Liturgy. The photo of clergy celebrants was taken at the church. Fr. John was born in Atlanta Georgia. After completing high school, Fr. John enrolled in Auburn University, in Alabama, graduating with Bachelors’ Degrees in English literature and economics in 1982. While completing his coursework, he completed Army ROTC training, and upon graduation was received a commission as a Lieutenant in the National Guard. Fr. John married the former Patrice O’Gwynn in March 1983. They are blessed with three sons: Nicholas (now age 27), Andrew (25) and Aaron (16). Matushka Patrice, Nicholas, and Andrew attended the Liturgy, Aaron was unable to as he was not yet 18 years of age. Fr. John attended Dallas Theological Seminary 1984-1986 and then enrolled in the Reformed Theological Seminary, graduating with an M.Div. Degree in May 1988. Later he received a Masters of Theology Degree in May 1990, with a concentration in Church history. While completing the ThM, he was ordained a deacon in the Episcopal Church in 1989. Upon being ordained “Priest” later in 1989, he entered active duty in the US Army as a Chaplain, where he subsequently was deployed and served in Operation Desert Storm August 1990-1991. He was released from active duty in May 1996, and returned to the National Guard as Chaplain. Fr. John began service as a Chaplain in the Federal Correctional Institution in Pekin, IL January 1997, arriving just days before his 37th birthday, the cutoff for Federal Corrections employment! He recounted his travel by car in inclement weather, wondering if this was the right move for him and for his family. Due to his own historical research in college and dialogue with Orthodox clergy, he began the OCA Late Vocations Program that same year. Fr. John was baptized into the Orthodox Church in May of 2000, and ordained a priest on February 10th, 2001. He was assigned Priest-in-Charge of Holy Apostles Mission, Bloomington, IL, and was endorsed for reserve military and prison chaplaincy that same year. Fr. John was deployed a second time, serving in Operation Iraqi Freedom 2003-4 as a Reservist Chaplain. With the creation of the Office of Institutional Chaplains in 2005, Fr. John became a member of the Institutional Chaplain community in November of that year. He was transferred to the Federal Correctional Institution, Aliceville AL, August 2012. Released from duties at Holy Apostles Mission, he was received into the Diocese of the South and Atlanta Deanery. Fr. John was again transferred to the United States Penitentiary, Atlanta GA, August 2014, and with this move was attached to St. John the Wonderworker Church. Fr. John will officially retire from the Federal Bureau of Prisons, January 2017, and will be contemplating next steps as his official retirement date draws near. Fr. John returned for Liturgy at St. John’s Church together with Fr. Thomas and Fr. Steven on Sunday. The congregation sang “Many Years” to Fr. John, continuing the previous day’s celebration. 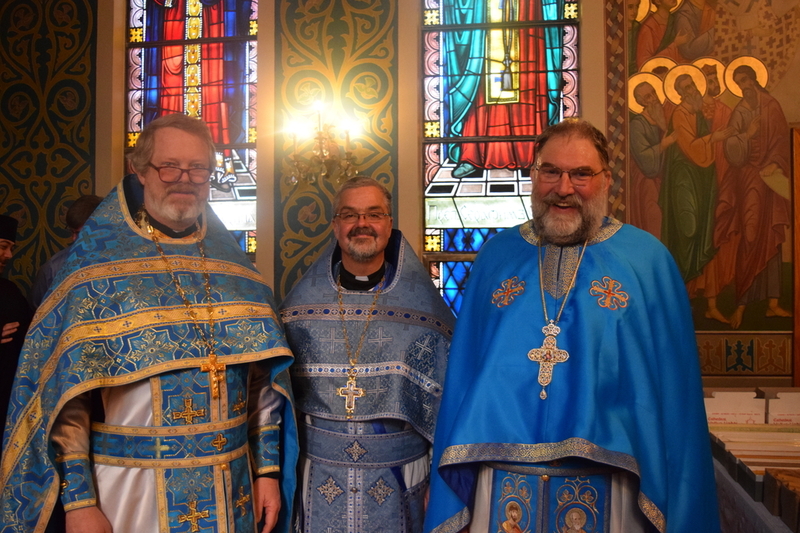 On Tuesday, February 2nd, the Feast of the Presentation of the Lord in the Temple, Hierarchical Divine Liturgy with ordinations of two St. Tikhon's seminarians was celebrated by His Grace, Paul, Bishop of Chicago and the Diocese of the Midwest. Concelebrating clergy at the monastery church included Fr. John Brown (on left in photo), who is our only OCA Federal (Bureau of Prisons) Corrections Chaplain, currently in Atlanta, Georgia, and Archpriest Daniel Degyansky (on right), who serves as a VA Chaplain in New York. Both clergy had connections to one of the ordinands. Fr. John and Fr. Steven met later to talk about Fr. John's ministry, and ongoing developments in the chaplaincy community. Fr. John joined seminarians at breakfast on Wednesday morning to talk about federal corrections chaplaincy. Fr. Daniel and Fr. Steven have previously presented on pastoral ministry together at parish ministry conferences. Fr. Daniel recently celebrated 25 years of priesthood. Thanks be to God for the opportunity to meet together on this wonderful festal celebration! With gratitude to Fr. 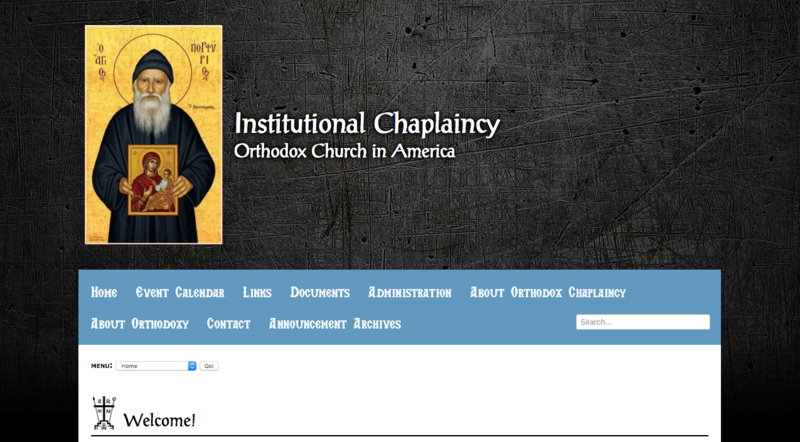 John Parsells of Orthodox Web Solutions, our OCA Institutional Chaplaincy Website has received a much needed upgrade. The photo is a snapshot of the new front page! The Icon now depicted on the front page is that of St. Porphyrios, a recently canonized saint whose incredible life included over thirty years of service as a hospital chaplain. Please read a biography of his life in the About Orthodox Chaplaincy page on this site. Finally, the Office of Insitutional Chaplaincy now has a Facebook page! Stories featured on our website will be visible on our Facebook page. The new version of our website page should be much more accessible. Please continue to pray for our Orthodox chaplains who are ministering to those sick, suffering, and incarcerated. 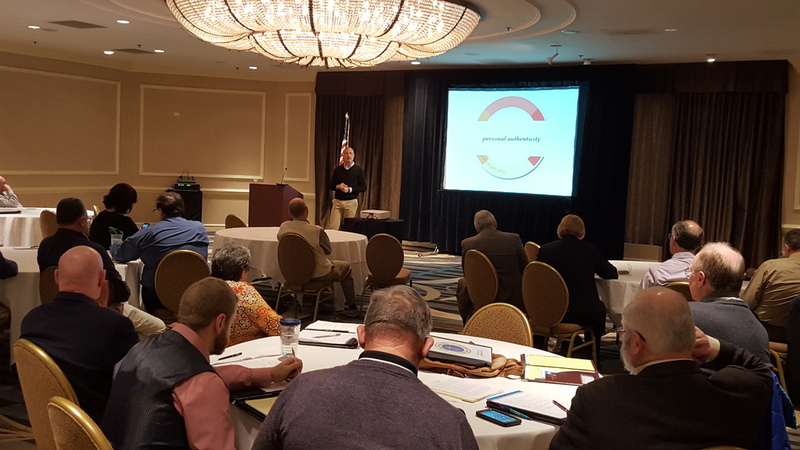 The Commisson on Ministry in Specialized Settings (COMISS) Network met in Alexandria Virginia on January 10-11. The OCA has been a COMISS member since 2005, celebrating ten years! COMISS is a network of credentialing bodies, endorsers, those who employ chaplains, and those representing VA and military chaplaincy. This year's presenter was Matt Bloom. Matt Bloom is an Associate Professor at the University of Notre Dame where he leads the Wellbeing at Work Program. He received his Ph.D. from Cornell University. He gave three presentations focusing on well-being in the pastoral realm. A significant part of these gatherings is the opportunity for networking among participants. Please watch on our website for some developments emerging from discussions over these past few days. 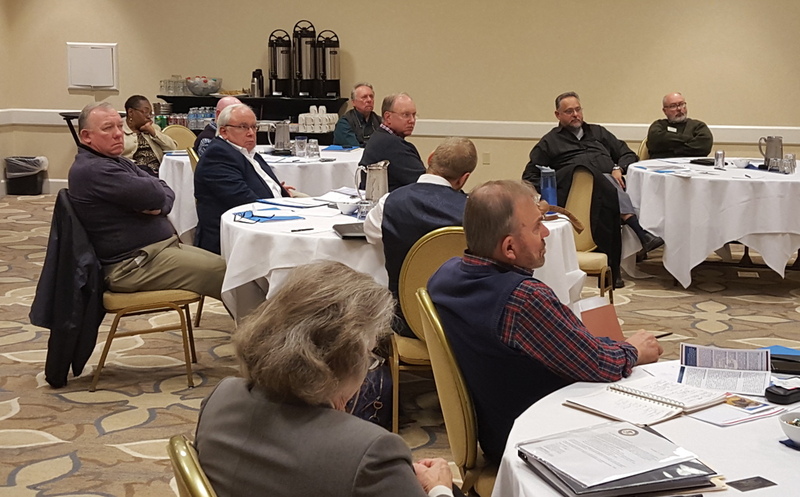 The Association of Religious Endorsing Bodies (AREB) and the Commission on Ministry in Specialized Settings (COMISS) will be meeting in Arlington, Virginia, next month. AREB will meet on January 7-8, 2016, and COMISS will meet at the same hotel from January 10-11. You can find out more about each of these organizations by looking on our link page.